Mewtwo first appeared in the original pair of Pokémon games, Red and Blue (or Red and Green in Japan), as a after-game "legendary" Pokémon. Though the Pokémon series is popular with the furry fandom, Mewtwo's back story makes him furrier than most Pokémon, as he is an experimental "uplifted animal," though in this case the animal uplifted happens to be a pink, vaguely cat-like Pokémon, rather than a real animal. Mewtwo was unlockable in the second Smash Bros. game, Melee, but he has not returned, until now, in any other installments. His cut from the roster was surprising, as he was the only non-returning character from Melee to have a unique special moveset, rather than a "cloned" special moveset from another character. 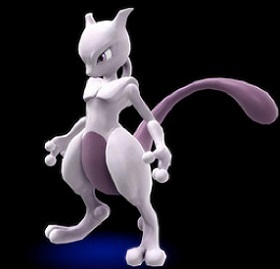 However, Mewtwo was not seen as one of the more successful characters to play competitively, ranking 21 out of 26 characters on at least one tier list. With the addition of Mewtwo, the Pokémon franchise is tied with the Super Mario Bros. franchise as the most represented in the latest installments, with six fighting characters apiece. Other franchises represented in the game with furry characters include Duck Hunt and Star Fox, Super Mario Bros spinoff franchises Donkey Kong and Yoshi's Island, as well as the third party guest franchise Sonic the Hedgehog. For a full list of furry characters appearing in the latest game, see here (though readers who consider unlockable characters in a game without a plot spoilers should avoid). That's not usually the franchise you hear moving consoles. But if they get a good star fox game and knowing the more solid library it is gaining, the Wii U is certainly not making the same error as the Wii did. i don't really think Duck Hunt is furry... also Krystal would in my opinion be terrible. for a furry character, there are plenty of options, many of which have more moveset potential and personality, but then again, i'm not a furry. This download crap is ridicoulous. Why not just have the character on the game? Playable or not, everyone loves Mewtwo. I have yet to encounter anyone who is like "I hate Mewtwo" or "he's a horrible character." He also happened to be the star of the only pokemon movie that was actually as dark as the source material/as it was intended to be. Besides that, he is not a clone of other chars. THIS IS NOT TEKKEN! Enough with the clone moves! Makes me wanna just go play the N64 and Melee version. Screw Wii and Wii U. That's pretty shallow to reject a great game just because it's leaving out one character or at least making him available for a very limited time. And SSB for the Wii U/3DS already has 5 playable Pokemon characters (Charizard, Greninja, Jigglypuff, Lucario, and Pikachu) which I think is enough already. Though admittedly Nintendo could have picked a bit better cast choice for the latest installment. I mean ROB and Toon Link again? Really? I think the idea is that this compels you to do so. Nintendo has been experimenting with "The Dark Side" lately. They used to be against things like "DLC" and "Micro-Transactions". Correct me if I'm wrong but I believe this content for the Wii U is the first time in Nintendo's history that DLC was used (won't be the last though, particularly for Smash: http://www.gamespot.com/articles/more-smash-bros-dlc-characters-on-the-way-and-u...). So I can see why fans of Nintendo's style are grimacing a bit. Oh Nintendo, have you changed. Of course it's not all negative, as long as they eventually allow people to buy the characters a year or so later (give them other options to get them without buying two systems/having to buy redundant games/etc) then the consumer base won't be so angry. Sure those people who bought both copies just to have MewTwo will be upset, but they'd be less upset if others still had to pay a little to get him if they wanted to. Then the least damage would be done to both sides. Keeping it so you had to buy 2 copies of the game to get him as a character could have very well backfired. If someone really wanted to play MewTwo they could have said. "I'm not buying two games for him, and I'm not going to get it unless I can play him, so I guess I'm not getting EITHER game." Those are probably rare, but it can happen. I mean, why don't Falcon players have to buy two games just to Falcon Punch? Guess they found that internet thing useful for something after all. Darnit, and I hate Lucas. I've sent in submissions for Krystal, Raichu, Keldeo, Braixen, Midna and Master Hand; I doubt they'll throw out multi-posts because I really doubt one vote will effect much at this point (especially since I suspect 4 of my 6 are totally not going to get the votes, while two are either safe without my vote, or not happening with my vote anyway). Also, they'll just be glad they're not joke votes for Beyonce or "my nuts, lol!" again. I did, however, note that the alternate color palettes for Keldeo should reference the Mane 6.